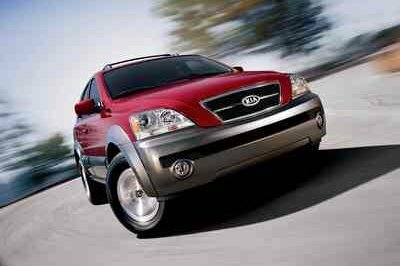 The Kia Sorento started life as a body-on-frame SUV for the 2002 model year and was redesigned in 2010 and 2014. Come 2017 and Kia gave the third-generation SUV its mid-cycle facelift by adding new design features on the outside and updating the tech package inside the cabin. The refresh also saw one of the two four-cylinder engines discontinued, leaving the Sorento with a choice of two drivetrains. However, Kia did announce that the hauler will get a diesel soon. Info about the oil burner is not yet available, but we know everything else about this SUV, so let’s have a closer look at the data in the review below. Design changes are far from massive, but this is not surprising for a facelift. 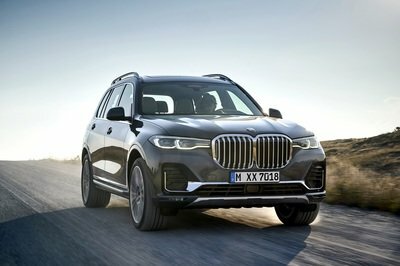 Up front, the grille retains the shape and size of the outgoing model, but the chrome inserts are bigger, which gives the SUV a more premium look. The headlamps also carry over as far as shape goes, but they’ve been redesigned under the lens and feature a thin DRL strip at the bottom. New LED lights are also available, but they’re standard only on the SX and SXL trims. Down below, the bumper remains similar, but the center vent was reshaped, likely for improved cooling and aerodynamics. Kia also redesigned the "ice cube" foglamps onto the sides, now with LEd technology on the SXL trim. There aren’t any notable changes on the sides save for the three new wheels designs that range from 17 to 19 inches in diameter. However, the rear section boasts slightly revised taillights with new light clusters and LED tech on trim EX and higher. The rear bumper gained new chrome trim around the brake lights, as well as a fake vent just above the apron. Needless to say, the update isn’t very comprehensive, but it will keep the Sorento fresh for a few more years. 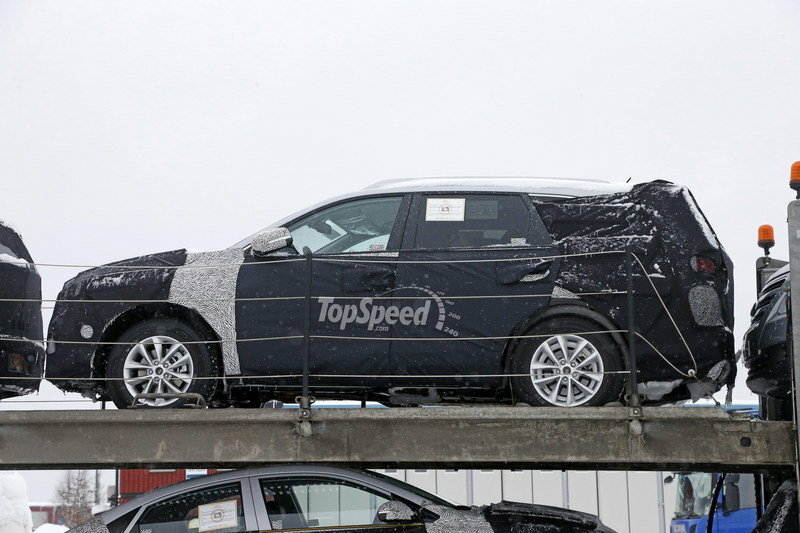 Design updates are mild inside the cabin too, but the SUV did get a brand-new steering wheel. The unit has four spokes instead of three, revised controls, and a more rectangular center section. The shifter knob is also new, while the revised instrument cluster has improved graphics. Kia also claims that it revised the A/C vents, but they look about the same to me. Design-aside, the Korean carmaker made some changes to the equipment lines and added new standard and available features. Options include heated and ventilated front seats, heated rear seats, 14-way power driver and 8-way power passenger seats, driver’s seat thigh extension, and a 4-way headrest with one-button adjustment. For 2019, the Sorento comes with two-way powered lumbar support for the front passenger on SX and SXL trims. There’s also available dual-zone HVAC and panoramic sunroof, as well as premium Nappa leather trim seating surfaces similar to those found in the Kia Stinger. Newly available interior/seat colors include Mahogany and Terracotta for the SX and SXL trims. An upgraded navigation system with Android Auto and Apple CarPlay is offered on higher trim levels, alongside an available 10-speaker Harman Kardon audio system. The second-row seat has a 40/20/40 folding layout, while the third-row seats fold 50/50. The configuration is now standard on all trim levels. As far as third-row space goes, the Sorento offers 31.7 inches of legroom and 36.3 inches of headroom. That’s less than what you get in the Honda Pilot, but more than the Toyota Highlander. Cargo room is rated at 74 cubic feet with the seat folded flat. That’s inferior to both the Honda Pilot and Toyota Highlander, which offer up to 83.9 and 83.7 cubic feet of luggage room, respectively. Under the hood, the Sorento lost one of its three engines. Kia decided to discontinue the turbocharged, 2.0-liter four-cylinder engine, mostly due to poor fuel economy figures compared to the V-6. The engine wasn’t powerful enough for the seven-seat configuration anyway. The remaining 2.4-liter four-cylinder and the 3.3-liter V-6 carry over unchanged. The former delivers the same 185 horsepower and mates to a six-speed automatic transmission with Sportmatic shifting. The V-6 continues to generate 290 horsepower, but now mates to a new eight-speed gearbox. The automatic transmission, borrowed from the Cadenza sedan, provides smoother and more seamless shifting. Kia said that the Sorento will eventually get a diesel in the United States, but didn’t provide additional information. The SUV rides on the H-shaped subframe, four-point bushing mountings, and Hydraulic Rebound Stopper-type shock absorbers. Kia offers a rack-mounted Motor Driven Power Steering (R-MDPS) with direct mounting of the electric motor on the steering rack, enhancing steering response and improving handling. Sorento continues to use the company’s advanced AWD system designed to automatically route power to the wheel with the most traction. The system also provides drivers the added stability of Torque Vector Cornering Control (TVCC), which is activated when yaw and steering sensors detect unwanted understeer. This is where Kia a big update, as the Advanced Driver Assistance Systems (ADAS) suite of safety features is now standard on Sorento EX trims and higher. In addition to Forward Collision Warning System, Smart Cruise Control, Blind Spot Detection, Rear Cross Traffic Alert and Surround View Monitor, the SUV also comes with Driver Attention Warning and Lane Keeping Assist. The former detects driver fatigue by monitoring vehicle and driving behavior and issues visual and audible warnings to encourage the driver to take a break. The latter helps alerts the driver and can even steer the vehicle back to its original position should the system detect the vehicle moving out of its lane. All Sorento trims continue to boast standard active safety features such as Electronic Stability Control, Traction Control System, Brake Assist System, Hill-start Assist Control, Electronic Brake Force Distribution, and Antilock Braking System. Features like Roll Over Mitigation and Cornering Brake Control are also standard on all-wheel drive models. Pricing for the Kia Sorento starts from $25,990 in L trim. Upgrade to the LX model and the sticker jumps to $27,490. Next up is the LX V6, which retails from $31,290, while EX V6 fetches $35,590 before options. 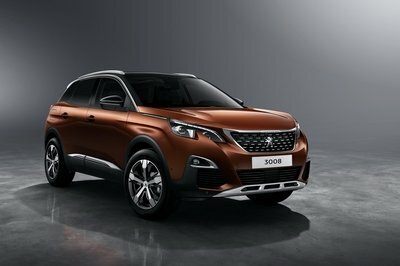 Finally, the SX costs $39,990, while the range-topping SX Limited comes in at $44,690. 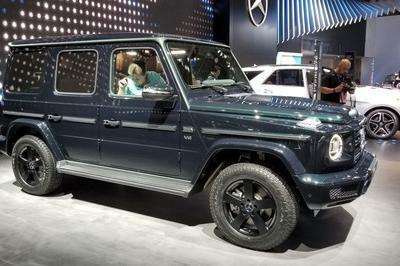 Having been launched in 2016 and updated for the 2019 model year, the current Pilot is fairly new. The Japanese SUV is now more appealing than ever design-wise and boasts an impressive tech package. The base trim is fitted with a rearview camera, a seven-speaker sound system and, as of 2018, the Honda Sensing driver assists package. The only engine is a 3.5-liter V-6 rated at 280 horsepower and 262 pound-feet. As far as third-row roominess goes, the Honda Pilot provides 38.9 inches of headroom and 31.9 inches of legroom. While second-row legroom is above average at 38.4 inches, third-row legroom is mostly on par with the competition. The Pilot retails from $31,450 in base trim, but Honda also offers a premium-oriented version. It’s called the Elite, it costs $48,020, and adds features like AWD, panoramic roof, wireless charging, heated second-row captain’s chairs, perforated leather, and multi-zone audio, among others. 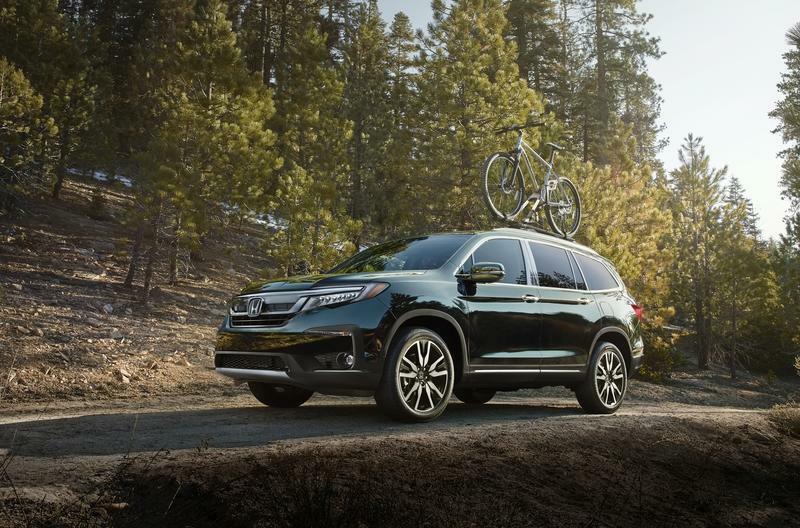 Read our full review of the 2019 Honda Pilot. Launched in 2013, the latest Highlander looks decidedly more modern than before thanks to its more polished front fascia and updated interior. Six models are available, ranging from a base, no-frills SUV that gets the job done to the LE Plus, which add a more powerful V-6 engine, a power liftgate, smartphone integration, and a large eight-inch touchscreen display. Premium features like a panoramic moonroof, leather seats, Bird’s Eye camera, and heated second-row captain’s chairs are also available with the range topping Limited Platinum model. The Highlander can seat up to eight people and provides 35.9 inches of headroom and 27.7 inches of legroom for third-row passengers. Pricing for the Highlander starts from $31,230, while the range-topping Limited Platinum version fetches $45,400 before options. Unlike most of the competition, the Highlander can also be had with a hybrid drivetrain. 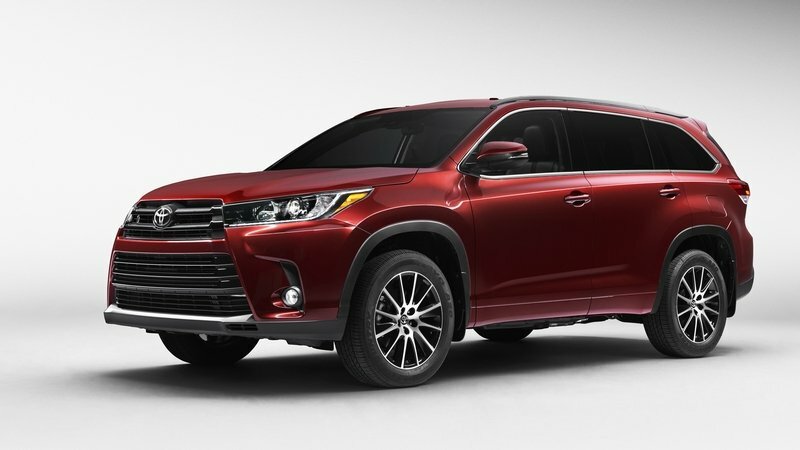 Read our full story on the 2018 Toyota Highlander. Although it was far from dated, it’s cool to see the Sorento get an upgrade so soon. The exterior updates will definitely keep things fresh for few more years, but it’s the cabin enhancements that make it much better than before. 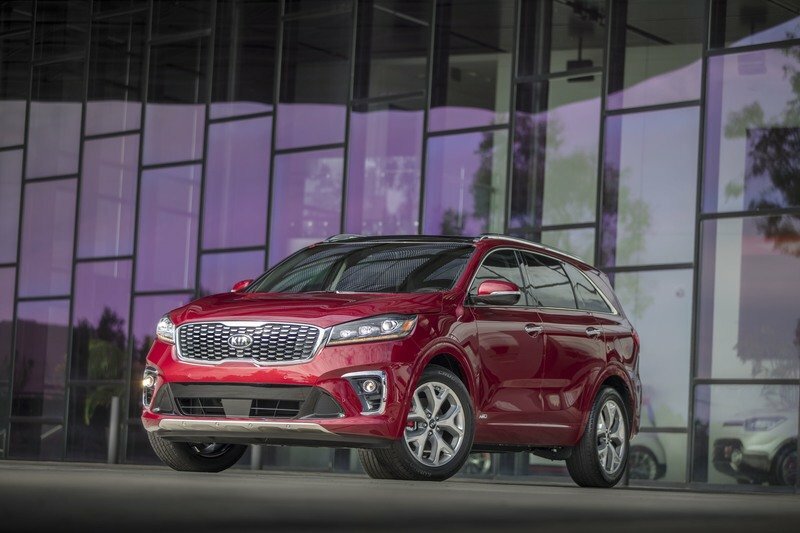 With new features and more standard equipment, the Sorento is finally on part with most of its competitors and even wins the battle against some of them. While the 2.0-liter engine was discontinued, the Sorento still has a couple of drivetrains to choose from, which can’t be said about other SUVs in this niche. With a diesel underway, Kia might gain an advantage here. On the flipside, the Sorento has a somewhat small trunk compared to other three-row vehicles. Kia Motors America (KMA) today unveiled the refreshed 2019 Sorento SUV at the Los Angeles International Auto Show. Refined, rugged and roomy, the Sorento remains as capable as ever, but touts a number of visual and feature enhancements, inside and out. Aside from new front and rear fascias, which help achieve a more sophisticated appearance, the cabin is now decidedly more upscale and integrates newly-added technology, including Driver Attention Warning,4 Lane Keep Assist1 and QuantumLogic™ Surround Sound. In addition, the Sorento now pairs its available 3.3-liter V6 with a new 8-speed automatic transmission for an even smoother and more seamless driving experience. Standard luxury features and amenities continue to be available across five trim levels – L, LX, EX, SX and SXL. Beautifully proportioned, the Sorento retains its refined and rugged exterior look, which was established when the vehicle underwent a complete redesign for the 2016 model year, and was in many ways inspired by the highly regarded Cross GT concept unveiled in 2013. But a subtle facelift now gives Kia’s popular crossover a tighter, sharper appearance. The revised front-end is headlined by a more artfully detailed radiator grille flanked by a new headlamp configuration, which offers full-LED lighting on upper trims – SX and SXL. The crossover’s familiar ice cube-style foglamps have also been redesigned featuring projection bulbs for EX and SX trims while SXL enjoys the more distinctive LEDs. 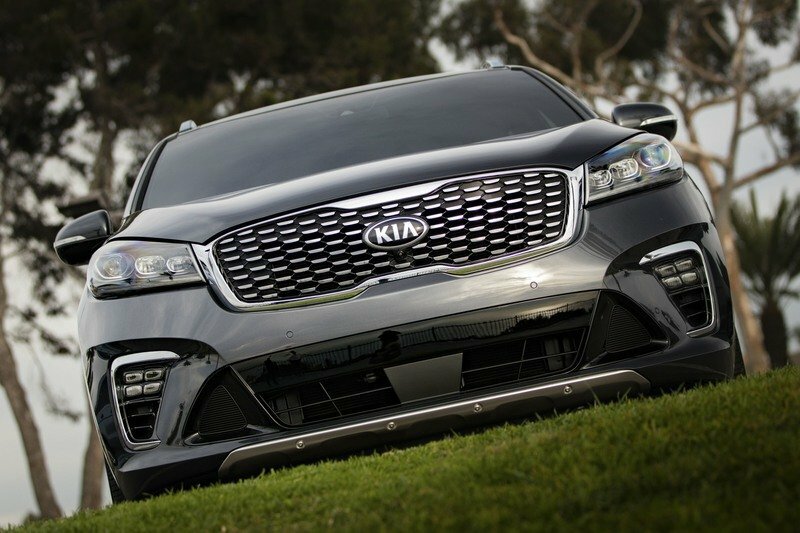 The Sorento’s front fascia wears a newly sculpted bumper design to achieve a more aggressive overall expression. 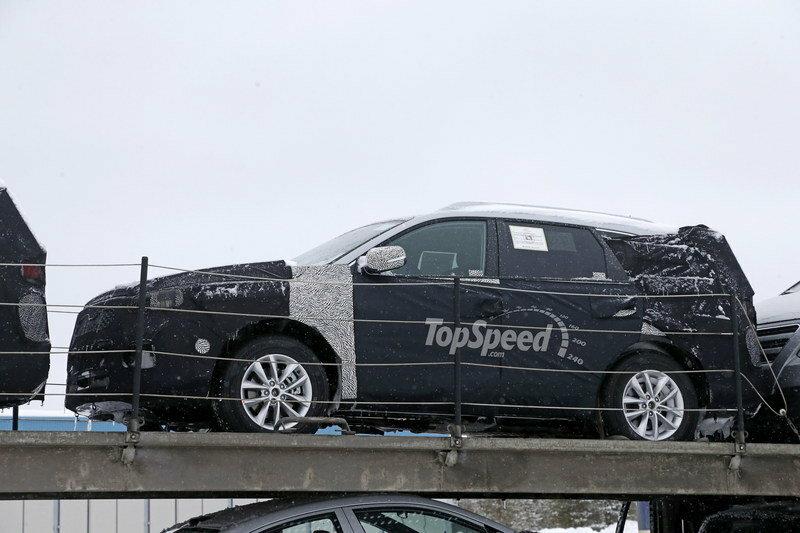 The rear fascia of the crossover has also been enhanced with a new bumper design, sleeker taillamps (LED bulbs for EX trim and higher), revised liftgate and a sportier muffler tip. And the Sorento’s muscular body rides atop three newly designed wheels, ranging from 17 to 19 inches, depending on trim level. Spacious and sophisticated, the Sorento’s cabin maintains a premium look and feel thanks to an array of upgrades and enhancements, including a new, more tactile steering wheel, new shifter knob and a revised instrument cluster with improved graphics. The makeover also includes alterations to the air vents and the center console design. Although these are minor changes individually, the cumulative effect is a more attractive interior space to be seen, felt and experienced. 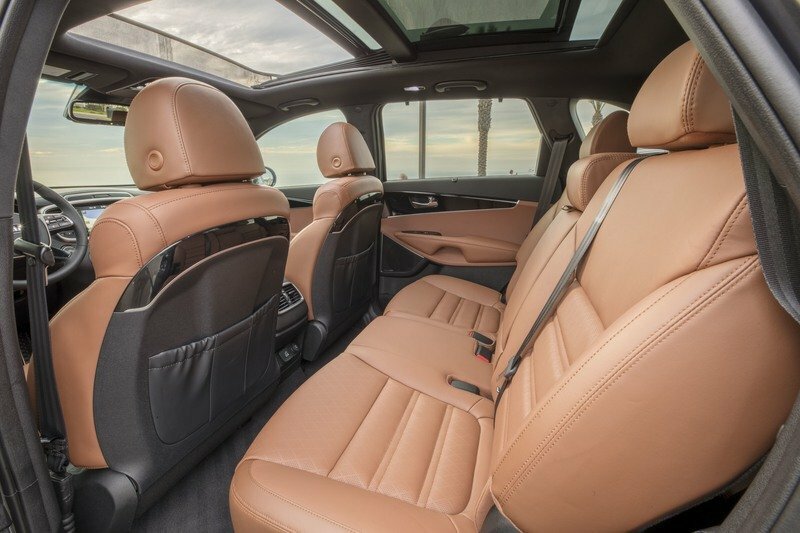 In terms of versatility, Sorento offers standard 40/20/40 second-row folding seats and 50/50 third-row folding seats now comes standard on all trims, providing space for up to seven passengers. The seating system is designed to offer optimum comfort and ideal seating positions to fulfill the needs of every occupant. For added luxury, also available are heated and ventilated front seats, heated rear seats, 14-way power driver and 8-way power passenger seats, driver’s seat thigh extension and a 4-way headrest with one-button adjustment. And for 2019, Sorento now offers 2-way powered lumbar support for the front passenger on SX and SXL trims. 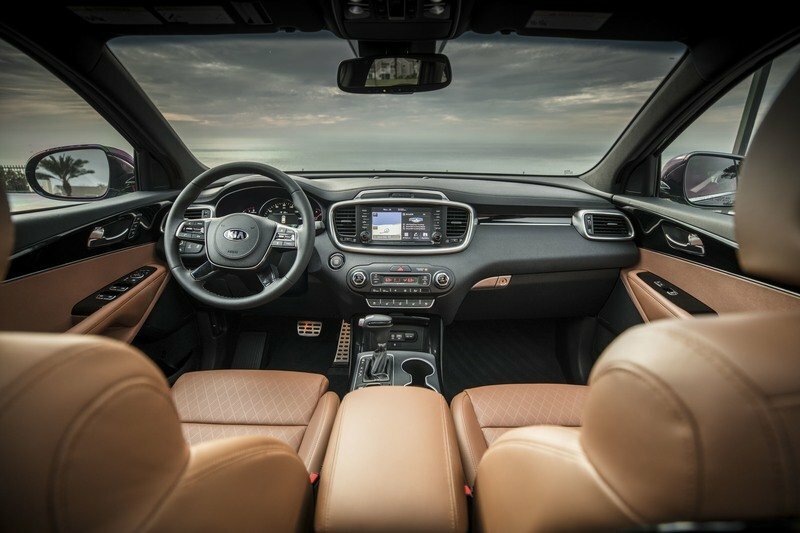 The Sorento interior also offers available dual-zone HVAC and panoramic sunroof, as well as available premium Nappa leather trim seating surfaces, similar to those found in Kia’s exciting new sports sedan, the Stinger. Newly available interior/seat colors are Mahogany and Terracotta for the SX and SXL trims, respectively. And updated interior accent trims are standard visual enhancements across all trim levels. Overall cargo volume accessed through the new rear liftgate is voluminous at 74 cu.-ft., providing an abundance of space for essentials and active-lifestyle equipment without sacrificing rear-passenger room. In addition, an easy-folding lever allows various seating arrangements, flexible luggage space and greater overall versatility. When it comes to audio technology, the available premium sound system is well suited to Sorento’s upscale atmosphere. The 630-watt, 10-speaker new Harman Kardon® branded stereo system with an 11-channel amplifier features Clari-Fi technology2 and newly integrated QuantumLogic™ Surround Sound technology.2 Clari–Fi works in real-time to rebuild audio details lost in digitally compressed music, while QuantumLogic™ extracts signals from the original recording and redistributes them into an authentic, multidimensional soundstage for playback that is clear, refined and full of detail. Ultimately, the result is a more robust and enjoyable on-road listening experience. With the Kia App store, select apps9 can be downloaded from iTunes®10 or Google PlaySM11. The Kia App connector is available for partnership with the content community for downloading apps such as Yelp®12, while Soundhound, Pandora®13 and iHeart® Radio14 come preloaded. The spirited front- or all-wheel drive experience is brought to life with a choice of two proven engines, including a 2.4-liter inline-4 GDI or a 3.3-liter V6 GDI. For MY19, the 2.0-liter turbo I-4 will no longer be offered as part of Sorento’s powertrain strategy. However, a new diesel engine with the latest emission controls is currently under development and more information is forthcoming. 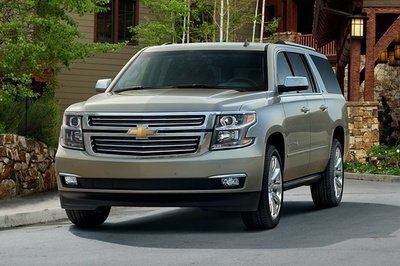 The carryover 2.4-liter engine is mated to a revised and more efficient electronically controlled six-speed automatic gearbox featuring Sportmatic® shifting and delivers a capable 185 horsepower. 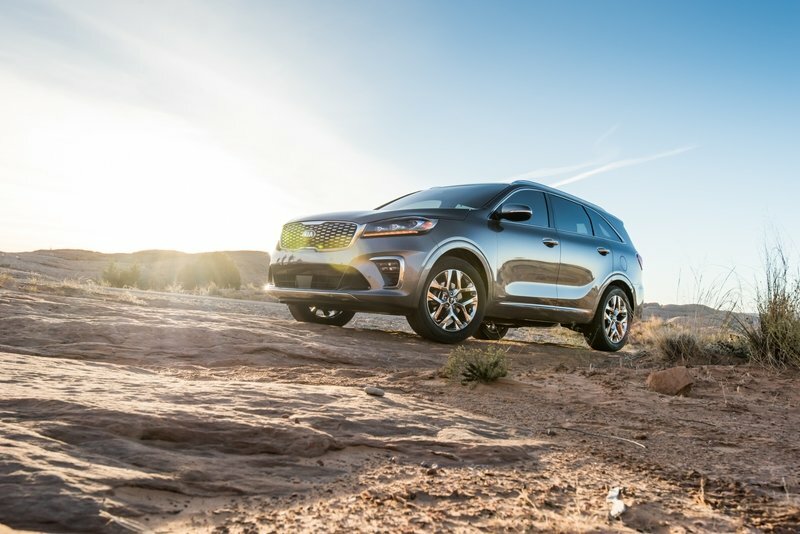 The Sorento’s familiar V6 brings with it a stampede of 290 horses while connecting to a new 8-speed automatic transmission shared with the brand’s Cadenza premium sedan. The result is a noticeably smoother and more seamless interaction between engine and transmission. This pairing also maintains Sorento’s towing capacity at 5,000 lbs when equipped with AWD. To achieve a more intuitive driving experience, Sorento replaces the former Drive Mode Select setup with the new Smart Shift & Drive feature across all trim levels. This enhancement automatically activates the optimum drive mode – Eco, Sport or Smart – based on driving style or may be set by driver preference. 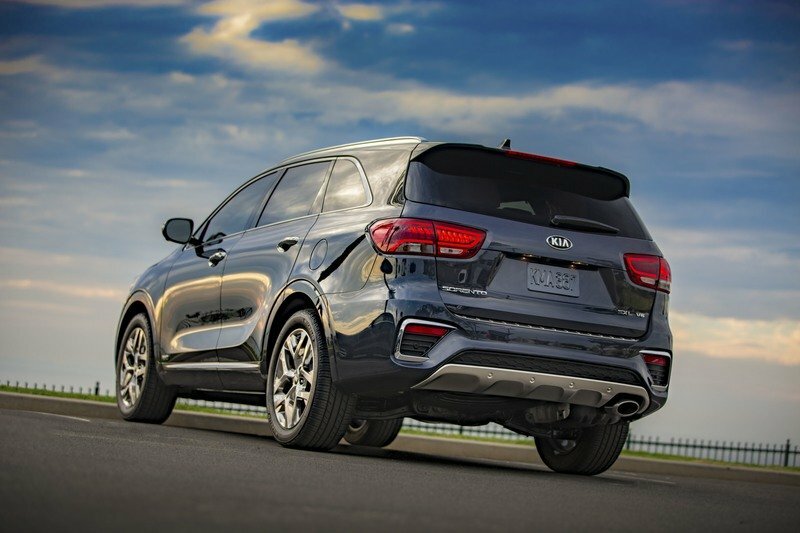 Kia’s suite of Advanced Driver Assistance Systems (ADAS) is now standard on Sorento EX trims and higher. In addition to Forward Collision Warning System (FCWS)1, Smart Cruise Control (SCC)1, Blind Spot Detection (BSD)1, Rear Cross Traffic Alert1 and Surround View Monitor (SVM)1, Sorento now offers Driver Attention Warning (DAW)4 and Lane Keeping Assist (LKA).1 DAW is designed to detect when driver concentration has waned by monitoring vehicle and driving behavior and, then, if it detects driver fatigue or inattentive driving practices, issues visual and audible warnings, including a coffee cup icon in the instrument cluster, to encourage the driver to take a break.” LKA helps alerts the driver and can even steer the vehicle back to its original position should the system detect the vehicle drifting out of its lane. 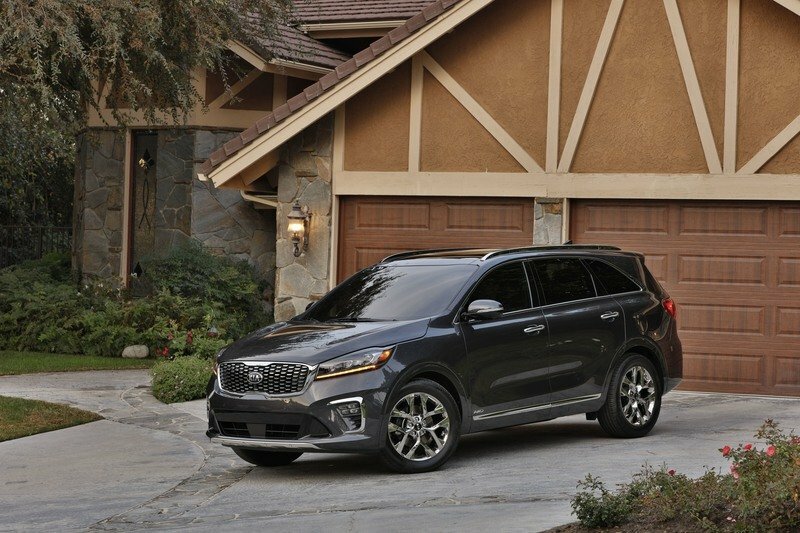 In addition, all Sorento models continue to offer standard active safety features such as Electronic Stability Control (ESC)15, Traction Control System (TCS)15, Brake Assist System (BAS)15, Hill-start Assist Control (HAC)15, Electronic Brake Force Distribution (EBD)15 and Antilock Braking System (ABS)15. Additional technologies such as Roll Over Mitigation (ROM)15 and Cornering Brake Control (CBC)15 on AWD models are standard equipment for improved dynamic control. 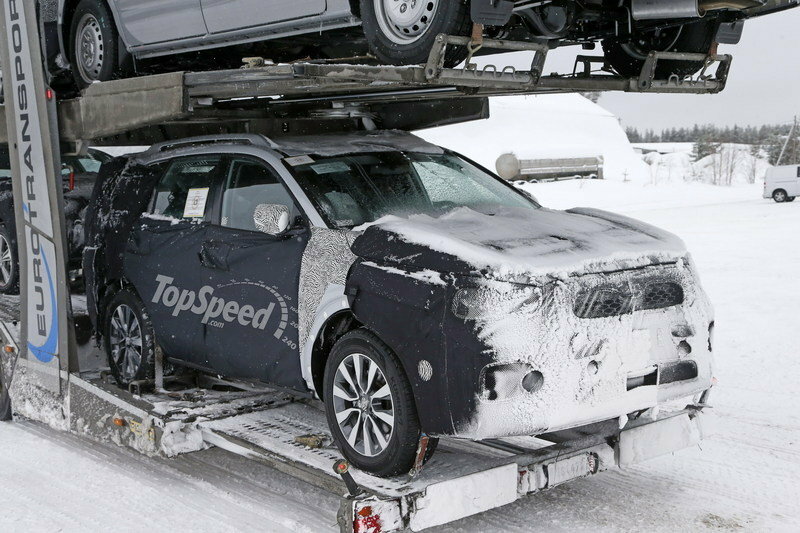 The core of the 2019 Sorento remains its rigid structure, with 53 percent of the unit-body consisting of advanced high-strength steel. Liberal application of industrial strength adhesives, the use of dual-seal lip joints as well as laser and large diameter welding techniques combine to make the Sorento solid and strong. 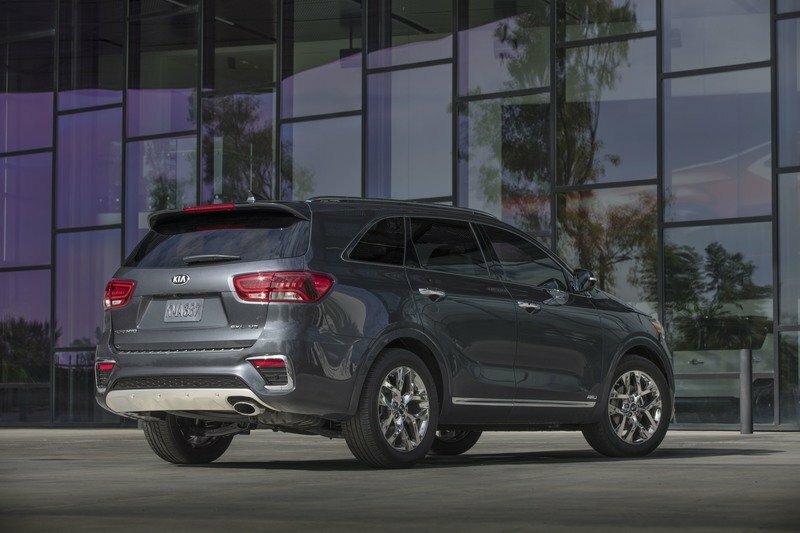 The Sorento’s well-proven suspension geometry and responsive steering system provide a quick and nimble behind-the-wheel feel. Ride and handling are optimized with the application of an "H" shaped subframe, four-point bushing mountings, and Hydraulic Rebound Stopper-type shock absorbers. And vertically mounted rear shocks contribute to a comfortable ride no matter what the driving conditions. The available Rack-mounted Motor Driven Power Steering (R-MDPS) features direct mounting of the electric motor on the steering rack, enhancing steering response and improving handling. 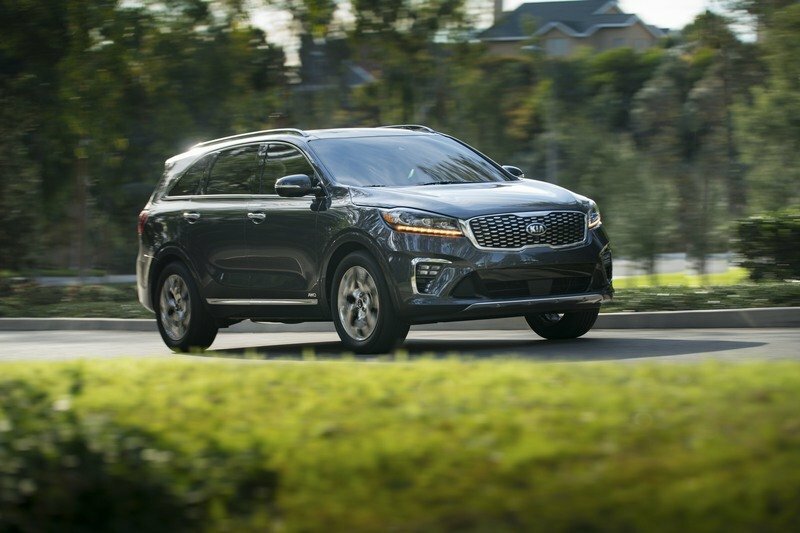 Sorento continues to offer an advanced AWD system designed to automatically route power to the wheel with the most traction. When conditions call for more sure-footed capability, the 4WD Lock Mode splits engine power evenly between the front and rear drive shafts. The system also provides drivers the added stability of Torque Vector Cornering Control (TVCC).15 The TVCC system is activated when yaw and steering sensors detect unwanted understeer.